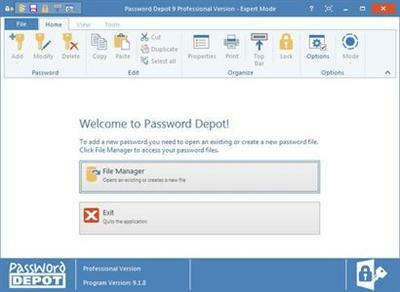 Password Depot is a powerful and very user-friendly password manager which helps to organize all of your passwords - but also, for instance, information from your credit cards or software licenses. The software provides security for your passwords - in three respects: It safely stores your passwords, guarantees a secure data use and helps you to create secure passwords. However, Password Depot does not only guarantee security: It also stand for convenient use, high customizability, marked flexibility in terms of interaction with other devices and, last but not least, extreme functional versatility. BEST POSSIBLE ENCRYPTION . In Password Depot, your information is encrypted not merely once but in fact twice, thanks to the algorithm AES or Rijndael 256. In the US, this algorithm is approved for state documents of utmost secrecy! DOUBLE PROTECTION. You can secure your passwords files twice. To start with, you select a master password that has to be entered in order to be able to open the file. Additionally, you can choose to protect your data by means of a key file that must be uploaded to open the file. PROTECTION AGAINST BRUTE-FORCE ATTACKS. After every time the master Password (If need) entered incorrectly, the program is locked for three seconds. This renders attacks that rely on the sheer testing of possible passwords - so called "brute-force attacks" - virtually impossible. BACKUP COPIES. Password Depot generates backup copies of your passwords files. The backups may be stored optionally on FTP servers on the Internet (also via SFTP) or on external hard drives. You can individually define the time interval between the backup copies' creation.